Tom and Ed Martin, publicans behind The Well, The Botanist, The Gun and more, have added another pub to their portfolio. In the shadow of the Barbican, Chiswell Street Dining Rooms offers City of London folk a chance at Chelsea style noshery. Londonist attended the well heeled opening of the pub last night. We enjoyed the cocktails, reckoned the bar staff could do a much better of pulling a pint of Guiness and found the canapes pretty yummy if not necessarily reflective of what's listed on their modern British menu. June means Lobsterfest at Belgo. Prices start at £6.35 for a rich lobster bisque with a one pound Canadian lobster halved and grilled with garlic butter and served with frites and salad setting you back £24.95. Like lobster and love Belgian beer? Belgo has five locations in London. The Real Food Markets at the Southbank Centre are now taking place Friday, Saturday and Sunday. Founder Philip Lowery says of the market, “Apart from Borough Market, we think this makes us the only other three day weekly market in London, which we believe is a key ingredient in ensuring that shoppers can find the best time to suit them to support these fabulous producers and take home some of the best food and drink you will find anywhere in London”. Vendors include The Thoroughly Wild Meat Company, The Ethiopian Coffee Company, Outsider Tart and Farmer Gosden's Luxury Jersey Ice Cream. Visit www.realfoodfestival.co.uk/markets for more info such as event listings. Also in food market news is the brand new Farmer's & Fine Foods Market. Launching 18 June on Portobello Road, the market is scheduled for every Friday to Sunday from 10.30am, and promises “a wide range of organic and quality food produce to reflect the diverse palate of today’s Londoner”. The launch on the 18th will include food and wine tasting, face painting and food from more than 30 stalls with suppliers such as Old Hall Farm, Fishmonger’s Kitchen and Cinnamon Tree Bakery. More info at www.portobellofinefoods.co.uk. 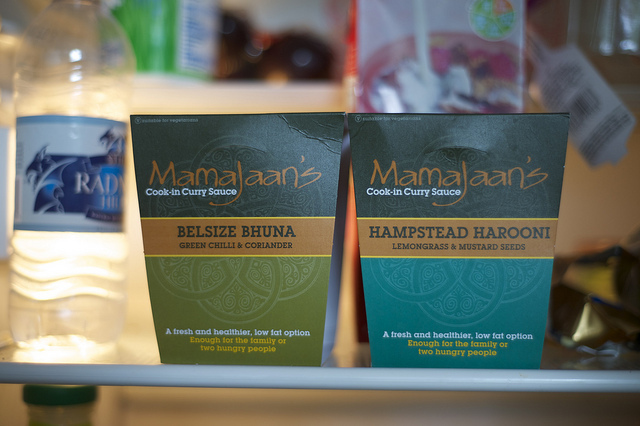 If your preference is to cook at home but you find yourself in an economic, creative or time-strapped pinch, consider Mamajaan's cook-in fresh curry sauces. These new additive and preservative free sauces are made by working Hampstead mum Anjam Jabeen and currently available at Fortnum & Mason, Hampstead's The House of Mistry and Budgens stores across North London (at a recommended retail price of £3.49 for 500ml pot). Seeing her business endeavour as an opportunity to “taste the Punjab with a London postcode”, Anjam has given her curries London-y names. We can attest that the Belsize Bhuna and the Hampstead Harooni offer satisfying options for quick and easy meals. We reckon knowing there's a pot or two of these awaiting in the fridge after a long day of work would be a comforting thought during any end of day slog back home. Visit www.mamajaans.co.uk for more info.